Wall Street lost more than 45 percent of the average investor's savings twice in the past decade. As a result, many Americans have no clue when or if they will ever be able to retire. Pamela Yellen, a New York Times bestselling author, financial investigator and consultant to financial advisors, knows these concerns. Like most Americans, she followed the conventional wisdom of investing in stocks and mutual funds, only to see her savings depleted. So she took matters into her own hands. As a consultant to more than 40,000 financial advisors over more than 20 years, Pamela investigated more than 450 financial products and strategies. She concluded that Americans are being brainwashed into accepting they have to risk their money in order to grow it. "The vast majority of Americans have been sorely misled, time and again, by so-called experts who preach widely-accepted investing and savings methods that history has repeatedly proven simply do not deliver," she says. Pamela's research led her to a little-known method that prudent, fiscally savvy Americans have used to grow and protect their savings in every period of boom or bust for over 150 years. This savings strategy is the basis of her New York Times Bestselling book, BANK ONYOURSELF: The Life-Changing Secret to Growing and Protecting Your Financial Future. Today more than 400,000 Americans are using this method to achieve predictable savings growth, financial security and self-sufficiency. Pamela is so confident of its effectiveness that she has offered $100,000 to the first person who can find a better financial strategy. A refreshing alternative to the same old voices touting Wall Street's conventional wisdom, Pamela has appeared on every major TV and radio network, including ABC, NBC, CBS, CNN, FOX, and NPR. Her articles have appeared in hundreds of publications and websites, including USA Today, The Huffington Post, and Fortune Small Business. Now she has created a new financial literacy curriculum that teaches proven methods to help people get out of debt, build savings and achieve lifetime goals. These are the strategies and tips people need to be self-reliant and secure. "You are entitled to set and meet your own lifestyle and retirement goals, without ever worrying about whether Wall Street, real estate, gold or any of the other unpredictable financial markets will suddenly crash, robbing you overnight of your dreams and the rewards of your hard work," Pamela says at her website, BankOnYourselfNation.com. "Our mission is to provide you the plain, honest truth about money and finances that you won't get anywhere else." 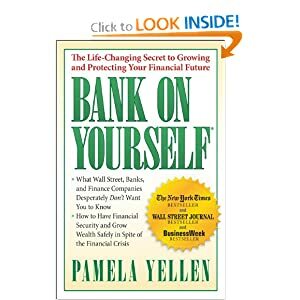 To learn more about Pamela Yellen and Bank On Yourself, visit her public websites www.BankOnYourself.com and BankOnYourselfNation.com. This book makes you truly think about the way that you manage your money. As you read through the chapters of this book you are brought into a new world where you are forced to choose how you will take your money and make it work for you. The author uses her knowledge and expertise to walk the reader through some easy to understand options for how you should consider your options. The book itself was engaging and easy to understand. What I liked most were the stories that were shared within the book. All of the stories that were shared did a good job at bring the whole Bank On Yourself (B.O.Y) concept to the forefront making the ideas tangible and attainable. This book opened my eyes to so many new ideas that I am looking forward to try in my own household! Handvibes Offer Fun for All Kids! New Web Series from the new TV Show Pan Am! THE LION KING 3D Hits Theaters Today! SPOOKY BUDDIES on Blu-ray & DVD 9/20! Winnie the Pooh on Blu-ray & DVD 10/25!